In spite of all that delightful snow still hanging around, Easter is coming. Punxsutawney Phil may be a liar, but the calendar is not. My mom put some Easter pictures in a scrapbook for me several years ago, and today seemed like a good day to discuss them. I also pulled out some pictures of my own girls when they were about the same age I am in these photos. Their pictures were not so much in a scrapbook as an old green envelope dropped into a brown paper bag, but still...I've got 'em. I think I'll put those in a separate post though, because pictures need words and I've already got more than a few. My siblings will love this. Age 5. I'm the one in the pastel blue dress looking a little anxious, and that's my 4-year old sister beside me looking like queen of the universe. My brother and older sister are in back. 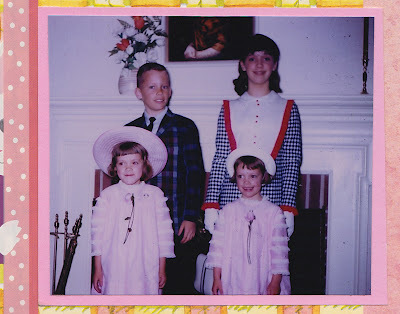 I loved that dress, and in a nutshell that's one of my strongest Easter memories-the clothes. Before anyone gets excited I know what Easter is all about, but still a great dress made a special day more special. Age 6. I'm the one in pink, teehee. 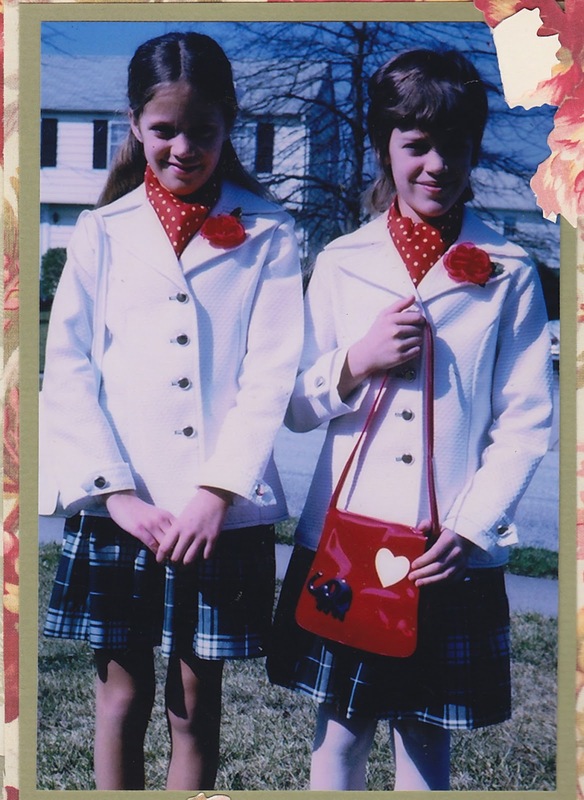 Many years my sister and I had matching dresses...also matching hats, purses, gloves, tights, and shoes. I don't think we minded. I wish I knew what was going on in the corner of the room that's making us laugh. Whatever it was, it seems my older sister and brother weren't in on it. Age 7. I'm wearing little white gloves as was the custom in the mid-1960's. When did we stop wearing gloves? I mean other than the kind we wear now in cold weather that have the fingers cut out so we can still text? 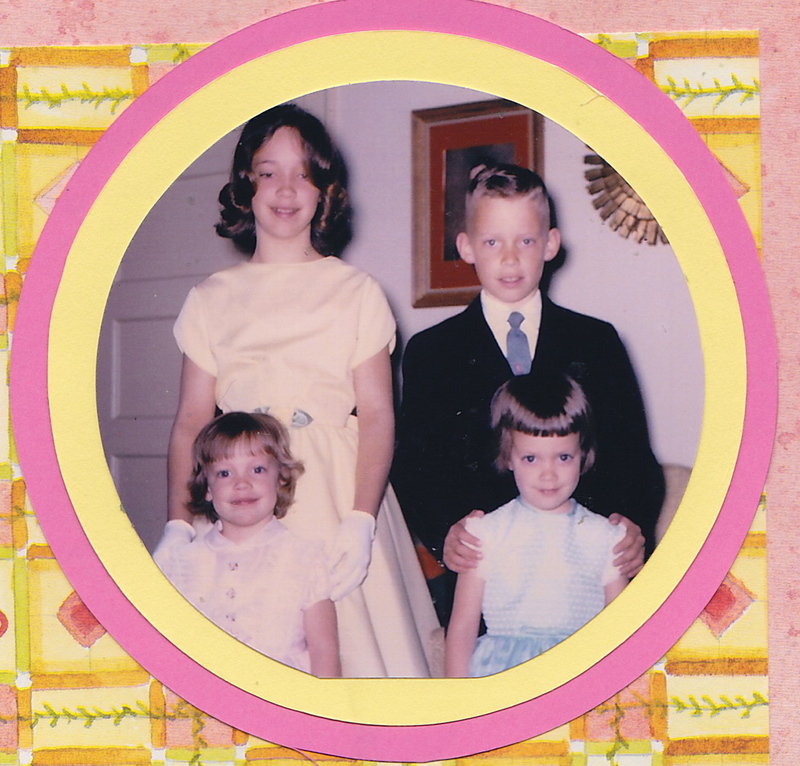 Easter dresses were almost always pastel and we always wore tights and got new 'church' shoes too. It looks like my mama rolled my hair...I remember we always had our hair washed on Saturday so it would look nice for church. Having your hair washed in 1967 also meant you'd sit under a ginormous hair dryer for what felt like for-ev-ah to get it dry. Age 8. 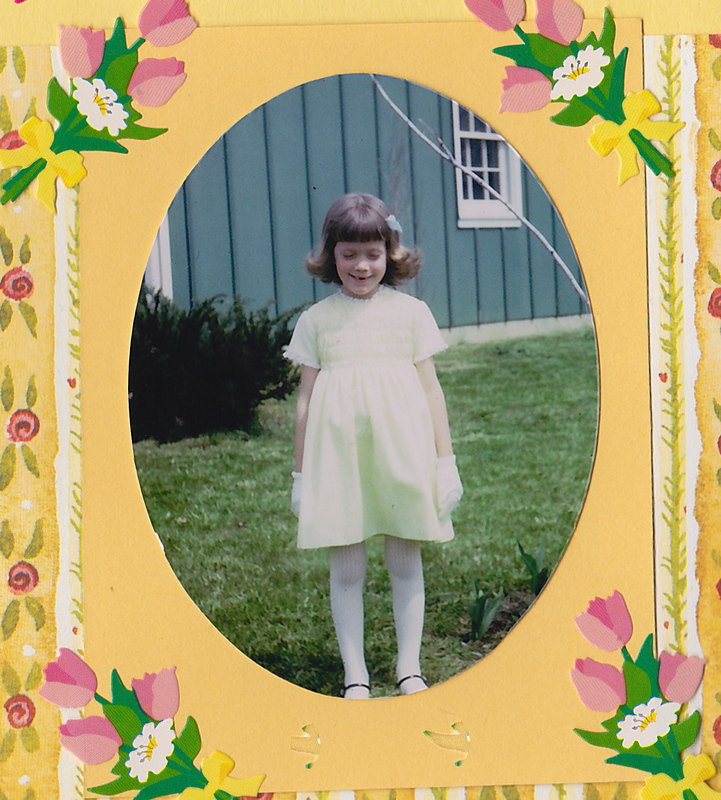 Although it's not obvious from my pose, this was my absolute favorite Easter dress. It was not pastel, but rather a bright bright orange and bright bright yellow, and best of all it had a matching bow for my hair. Plus I loved those shoes...I called them my pilgrim shoes. Taking a photo outside before we went to church was a family tradition. Not sure if I'm posing or sulking, but either one is possible. 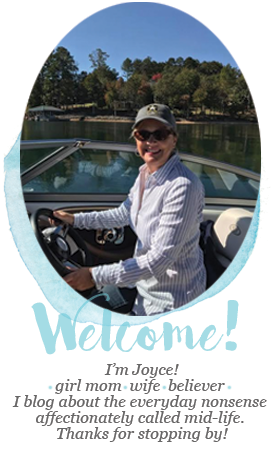 My mother is looking very Jackie Kennedy-esque here, isn't she? Oh how I loved a new spring coat. I think it's safe to say I still have a bit of a thing for pretty coats. ahem. I blame my mother. I'm curious now about where this picture was taken because that doesn't look like our front porch...hmmm. Also, there's one thing I've noticed as missing from every.single.picture- my dad. One of these Easters he was in Vietnam, but not every one. I guess tradition also dictated he snap the outdoor photo. Yesterday was Palm Sunday. I wore a black turtleneck, boots, and my winter coat and gloves to church. I'd love to think next weekend we'll be able to whip out the pastels, a light sweater, and maybe snap a photo outside in the spring sunshine, but we shall see. I read something last week about why adults have a hard time explaining Easter to small children. It's hard partly because most children (rightly so) have no real grasp about the heaviness of life...the loneliness we sometimes feel and our deep seated need to find meaning and purpose. Why forgiveness is needed on a grand scale. Most children haven't experienced big hurts or seen the way this world damages people. These are things most of us don't learn until we grow into adulthood. When I was a little girl my family went to church every single Sunday, but even as a child I recognized Easter Sunday was not like all the rest. New clothes, a special meal, dressing up and taking a picture beside my brother and sisters before we left for church...these small, seemingly superficial acts helped mark the day as something more than ordinary. In those long ago springtime Sundays of my childhood, the seeds of Easter's meaning were planted. They were watered through the years, and like tulips in a backyard garden, bloom bigger every year. My grown up heart is well acquainted with the great gift of Easter...that gift is hope. "...I am the resurrection and the life. "In those long ago springtime Sundays of my childhood, the seeds of Easter's meaning were planted." My experience exctly!! I also have some of those cute Easter pictures kicking around, unfortunately without all the sisters! I can also relate to the Saturday ritual of bathing and hair! Yesterday's sermon at church was actually the best one I heard explaining why Easter is when it is in relation to Passover. It only took me 47 years to figure it out. I remember the dresses and tights too. But I don't think I ever got white gloves. I remember, all too well, trying to get a good family photo before heading for church on Easter morning. At least one of my children was always frowning or squinting! 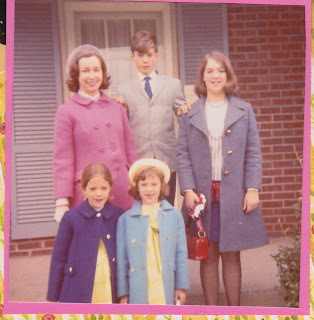 Your pictures make me want to look through our family's Easter pictures! I think we took one every year, too. It was sooo exciting to get a new dress for Easter! The bright orange and yellow one is my favorite too! Hope it's nice enough this Easter to wear a cute springy dress! Oh my, the memories. Oh yes, back in the day, Easter was VERY special ... seeds were planted. I hope to be able to wear a nice dress with just a sweater this Easter, but I'll be honest ... if it gets very warm, the powers that be at church just turn on the AC and crank it up. I can't even wear warm-weather clothes in the middle of summer! :-( I've given up on trying to be too fashionable at church, since most of my clothing is hidden under several layers in an effort to keep warm. We always got new dresses and shoes too, but I don't believe there were too many pictures taken. I may have to ask my mom and look through her stuff. Really Cute! I recall getting gloves maybe once. Big sis was not a fan... (shionista)and she pretty much called the shots for years so I was not indulged. Not bitter at all, am I? Ha. Oh Joyce, this is such a precious post. I loved reading every word and seeing the record of Easters past. 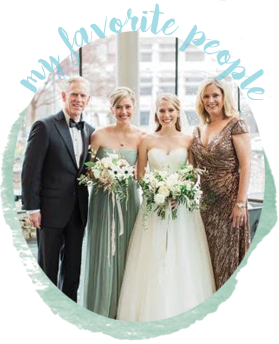 It brought back so many similar memories of a childhood where Easter meant a new dress, new shoes and a feeling of great confidence and anticipation as we walked the short distance from the parsonage to the little country church our father pastored. Thank you for sharing such precious memories. By the way, I also wore a black turtleneck sweater and fur vest to church yesterday. Seemed and felt perfect. Have a great week as we look forward to celebrating our Risen Lord on Sunday. I so enjoyed looking at your Easter pictures, Joyce! Absolutely adorable! 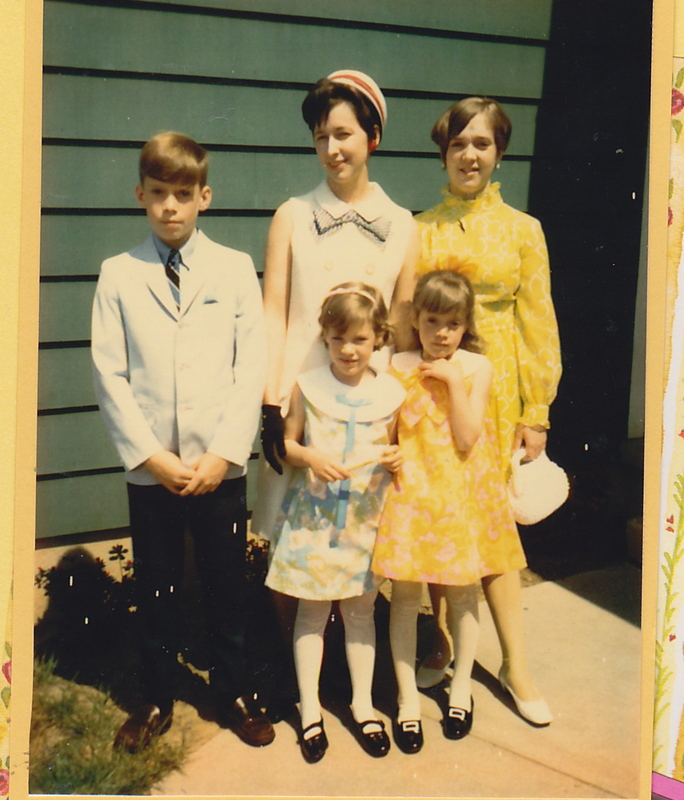 My mom always made the biggest deal out of finding the perfect Easter dress for me as we always went to my grandma's house each year. It was a very big deal...and I'm thankful to have those memories. At that age it was all about the dress and the Easter bunny! I enjoyed looking at your photos. You looked so sweet in your nice outfits. The pictures bring back the times gone by and point to the change of attitudes now days. I loooooooved my Easter dresses. They were always gorgeous, or at least the few that I remember. I haven't really celebrated in a long time though. I think I was ten or eleven last time I celebrated and that was just my mom and I going to old stockyards in the city we used to live in. I never really understood what Easter even was until around the time I was a teenager. Even then, it took me a long time to grasp the true meaning of it. oh you were so cute, Joyce! You really look the same. They say 52 of Easter so I hope also to take some photos outside. I don't know that the question is why did we stop wearing gloves so much as why did we wear them in the first place? They just got sweaty and dirty and lost. Weird. Oh this is adorable! It brought back many memories standing on our front porch taking our Easter pics! ....I may have to go dig a few up myself! And the orange dress and the pilgrim shoes are hands down my favorite too! !